Last Friday afternoon, Niladri Chatterjee, known by his pen name Niloy Neel, was murdered by a group of men who deceived their way into this building and butchered him with a machete. It’s the latest in a string of murders of Bangladeshi writers and bloggers who all identified variously as humanist, atheist, freethinkers or secularists. Following the first such murder, in 2013, the authorities conceded to Islamist demands and arrested several bloggers under laws against ‘hurting religious sentiments’ in online communications. It is impossible to know for sure if these prosecutions emboldened the Islamist hit mobs, but it certainly has not slowed them down. His is the fourth such assassination in 2015 alone, beginning with the hacking to death of renowned writer and activist Avijit Roy in February. These Al Qaeda-linked militants are openly waging a terror campaign of assassinations of targeted secularist bloggers. 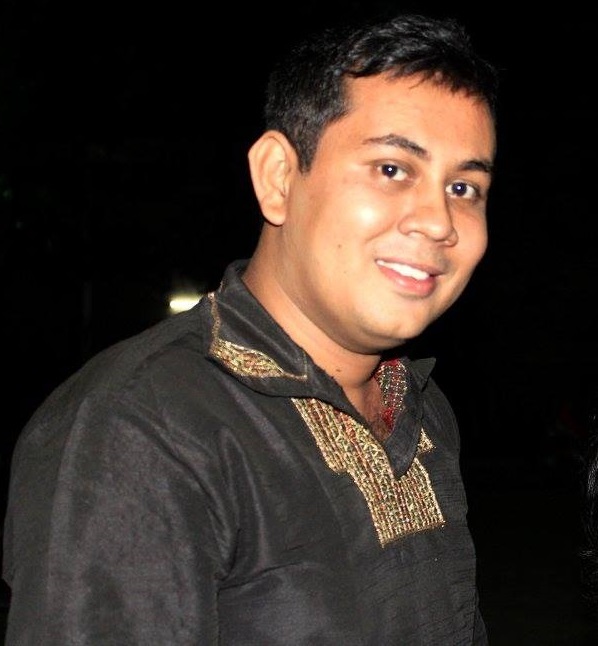 News reports indicate that Dhaka police ignored earlier complaints from Neel that he feared for his life. The Special Rapporteurs on freedom of expression, David Kaye, and on extrajudicial executions, Christof Heyns, said in a news release issued yesterday that the violent killing of another critical voice in Bangladesh shows that serious threats to freedom of expression persist in the country. There’s a round-up of further responses under the headline “Bangladesh’s continuing shame” over at Canadian Atheist. Astoundingly, in the days following this most recent murder, Bangladesh state authorities and political institutions made matters worse in a series of unfortunate pronouncements. Islamist organizations including political institutions such as the Awami Olama League, an Islamist group closely-associated with the ruling Awami League party, reiterated calls to implement a death penalty for those voicing non-religious views in general! In an extraordinarily myopic and backward statement, the Inspector General of Police threatened bloggers — the very people being killed — with arrest. Two days after the murder of Niladri Chatterjee Niloy who said he was refused a complaint [i.e. he tried to seek protection from the police], the inspector general of police (IGP) has advised the bloggers not to write blogs that may hurt religious sentiments. AKM Shahidul Hoque’s call comes at a time when police are drawing harsh criticisms over their failure to solve the cases of killings of four bloggers in six months this year. “Any offender of religious beliefs may get the highest punishment of 14 years (in jail). But killing someone for that offence is never acceptable,” said Hoque. He said if anyone was sued for hurting religious feelings, that person would be brought to justice. And a Cabinet Committee no less said that atheist writers in general were “criminals”, with the Home Minister later repeating the same message that bloggers should be arrested. Of course, such arrests have been made in the past, and could be made again, under Bangladesh’s quasi-‘blasphemy’ laws. Yet even though the police chief’s response to Neel’s killing sounds callous and censorious, doesn’t it also sound familiar? If you want to stay safe, don’t cross the line… where have we heard this before? We heard it after the Charlie Hebdomassacre. And again following the shooting at a free-speech event in Copenhgan in February. But then, it wasn’t a foreign police boss who was basically saying ‘Silence yourself if you want to live’ — it was liberals, Europe’s chattering classes, even the literary set, all of whom expressed the idea that murdered critics of Islam are responsible for their deaths long before Haque’s hamfisted response to the murder of Neel. With each blogger’s murder, Bangladesh’s founding ideals of being a country of freedom, rights, and creativity for a multi-religious, multi-ethnic and multi-cultural people are being eroded, weakened, and brought closer to being destroyed. This is no longer a question of government, party or ideological leanings. It is a question of survival of the Bangladesh our martyrs had laid down their lives for and those of us who work for it today dream for. Collectively, we all–the government, the intellectuals, the civil society, the media, etc– are failing our country and our people. If the war criminals, now being prosecuted and punished, tried to destroy us at birth, the blogger-killers are trying to destroy us now. However the unity, determination and strength with which we fought our enemies then are totally absent now. The present assault on our existence is far more insidious and difficult to fight against as we are divided and the ‘enemy’ is far more difficult to identify. There is only one way to defeat this ‘second’ attack on our Mukti Juddho and that is to really forget all our differences and take the plunge to destroy this threat as soon as possible. The government’s lack of commitment exemplified by its law enforcement agencies is shameful to say the least. The performance of police has been abysmal to put it mildly. Except in the case of Ahmed Rajiv Haider, the first blogger to be killed in February, 2013, in no other instances– Avijit Roy, Oyasiqur Rahman, Ananta Bijoy Das and now of Niladri Chattopadhyay, –can the police claim any credible progress. Today (Friday), it was reported that two men have now been arrested in connection with Niloy Neel’s murder, including the son of a high-ranking government Minister. At least one of the suspects was arrested and released previously in connection with a previous killing; it is not yet clear whether this is a case of arresting ‘usual suspects’ (either for show, or for speculative investigation) or whether it’s a sign of a real breakthrough. …asserted that the case is a domestic affair and that Saudi Arabia, which has an independent judiciary, will not tolerate any outside interference in the matter. …but don’t forget, women are treated as second class citizens, banned from driving for example, and human rights defenders such as Raif Badawi and Waleed Abulkhair rot in jail on spurious and absurd charges about ‘insulting religion’ or talking to ‘foreign’ media. 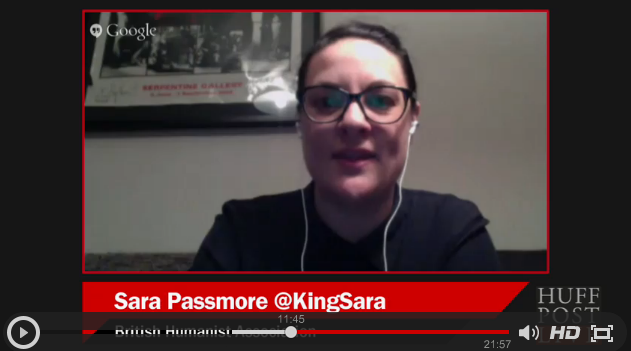 For our partner the Humanist Society of New Zealand (introduced incorrectly in the video) Sara Passmore discusses the new Harmful Digital Communications Act on Huffington Post Live (around 9:20). As we reported last week and previously, the new law appears to add to provisions which could be used to prosecute people if they say things against religion which cause others to “suffer serious emotional distress” or which are deemed to be “grossly offensive to a reasonable person in the position of the affected individual”. In other words, it’s a don’t-hurt-religious-feelings law. The New Zealand Herald covers the debate, quoting Justice Minister Amy Adams saying the concerns raised by the Humanist Society and others are unfounded, because: “A person would have to do much more than simply post blasphemy to fall foul of the criminal offence in the Harmful Digital Communications Act”. However, the New Zealand Humanist Society notes that they are not the only ones protesting apparently vague language that appears to allow anyone to bring proceedings if they alleged a digital communication caused them to “suffer serious emotional distress”. It was annual National Minorities Day in Pakistan on 11 August, so some lawmakers paid respects to religious minorities in parliament, or in some cases bemoaned that little had actually been done since the last National Minorities Day. Parliamentarians on National Minorities Day vowed to fight for the rights of persecuted minority communities, and in particular, work towards stopping forced conversion of Hindus and misuse of blasphemy laws against non-Muslims… A resolution marking the national day, moved by Minister for Ports and Shipping Kamran, was passed unanimously. “We pay tribute to the patriotic minority members who sacrificed their lives in war against terror — also for their services in different fields particularly education and health,” read the resolution. [… Leader of the Opposition Syed Khurshid Shah] said, “It is a testing time for non-Muslims and other minorities whose persecution could not be stopped, unfortunately, by the rulers.” He further said that the Pakistan Peoples Party’s (PPP) government in its tenure took a number of steps for the welfare of minorities but they were not enough. “We should go extra mile to protect them (non-Muslims],” he added. Meanwhile, The Senate unanimously also passed a resolution expressing complete solidarity with religious minorities and vowing to protect their rights on the occasion of minorities’ day on Tuesday. So what would it mean for Pakistan’s lawmakers to really uphold this reported pledge? By next National Minorities Day how many more prosecutions will there have been for blasphemy? How many more harassed or killed by mobs? Will there be some new legal reform to deter the most egregious uses of the law? Could it even, conceivably, be repealed altogether to bring freedom of expression into line with international human rights standards, so that people could express their criticisms, or their own religious views, and talk about religion without fear of the law kowtowing to Islamist extremists and dragging you to the courts? Isn’t that what such a pledge would really mean? Freedom of thought, conscience or religion, as set out in Article 18 of the Universal Declaration of Human Rights, is the most basic right of all – the right to choose what to believe, to practice your beliefs, to share your beliefs with others in a non-coercive way, and to change your beliefs. It protects the rights of people of all religions, and the right to have no religion. And it is increasingly under threat throughout the world.